When you find a spot that is popular with the ‘locals’, you’re almost guaranteed a positive dining experience. The crowded Café Riche with its lively terrace and belle époque architecture has been serving the discriminating palettes of Montpellier since 1893. A favorite with the locals, Café Riche is a reasonably priced brasserie with a fun vibe and marvelous food. Location: Place de la Comédie, Montpellier, France. It’s located on the large pedestrian square smack dab in the center of town. You can’t miss it. Menu: You’ll find the traditional offerings of a French brasserie: Steak Frites, the ever popular seafood platter, a variety of pasta and salads, crêpes, and too many desserts to count. No worries, of course there is a cheese platter. Beverages…the region of Occitanie is known for its wine, only local wine is served. Thoughts: The terrace was jam-packed with locals enjoying dinner and drinks. Our odds of finding a table looked slim. We were lucky though, the waiter saw us and motioned to follow him. He had one table available inside which we gladly accepted. Once seated, our waiter brought a bowl of assorted marinated olives, a basket of bread, and a small charcuterie plate. It was just enough to take the edge off our hunger pangs while we perused the menu. While I scanned the lengthy menu, I already knew I would order my favorite brasserie/bistro meal – steak frites. Taking our drink order, the waiter made several recommendations including steak frites and Escalope de Veau (Veal). He was pleased we ordered what he suggested. The restaurant is larger than it appears from the outside. There is seating at the bar, and the second floor reached via a spiral staircase has additional seating. The vibe is friendly. The waitstaff had a good rapport with the patrons (they seemed to know everyone) and each other. My steak frites were heaven on a plate and piping hot. I actually had to lift my napkin to protect my clothing as it was sizzling when placed before me. Served with a salad, it was a flavorful meal. I’m not a big fan of veal but I had to have a bite of my husband’s dish. The pepper mushroom sauce that accompanied the veal had the right amount of kick. The meat was so tender he could cut it with a fork. His dish also came with a salad and an assortment of spring vegetables. The waiter recommended Mousse Nutella Mascarpone for dessert and pointed to the next table where the patrons were gobbling it up. We were stuffed and passed on what looked like a yummy treat. The price for our dinner including wine was €40.50 (approximately $47). Tip: Keep the complimentary appetizers to a minimum to allow for dessert. Price Range: Salads range from €10.80 – €12.80 and are quite large. Pastas average at €14.90 and come with a salad. 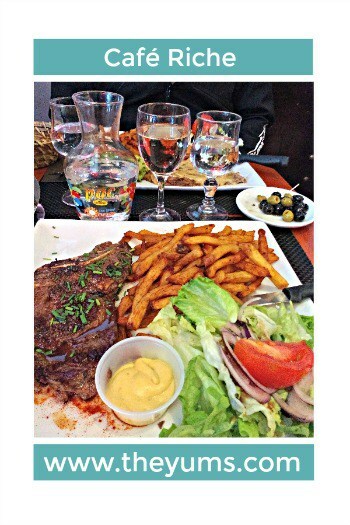 Steak frites, duck confit, and escalope de veau, all with a green salad, will set you back €15.90. The average burger with fries is a reasonable €13.90. Scrumptious desserts average €5.90. Wines are €3.90 per glass, bottles vary from €11- €28.